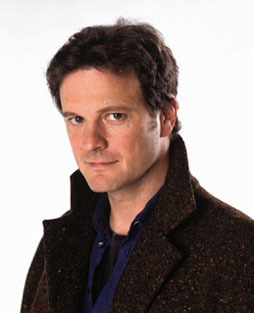 Colin Firth is a British actor, best known as Renée Zellweger's love interest in the Bridget Jones movies. He also played the spurned husband in The English Patient, an unwanted fiancé in Shakespeare in Love, a Victorian cad in The Importance of Being Earnest, Amanda Bynes' father in What A Girl Wants., and an obsessed soccer fan in the original Fever Pitch (without Drew Barrymore). In Helen Fielding's novel Bridget Jones's Diary, Bridget develops a crush on Firth as she watches his performance as Darcy in a BBC adaptation of Jane Austen's Pride and Prejudice. In the film of Bridget Jones's Diary, Firth played another Mr. Darcy. It was an odd but appropriate choice, and Fielding loved it, since her novel was loosely and playfully inspired by Austen's classic, and she had written it with Firth in mind. His parents were both academics, and due to their traveling, young Firth spent four years of his childhood in Nigeria, and one year attending junior high school in St. Louis.